Found one file extension association related to TAU producer and 1 file format developed specifically for use with TAU producer. 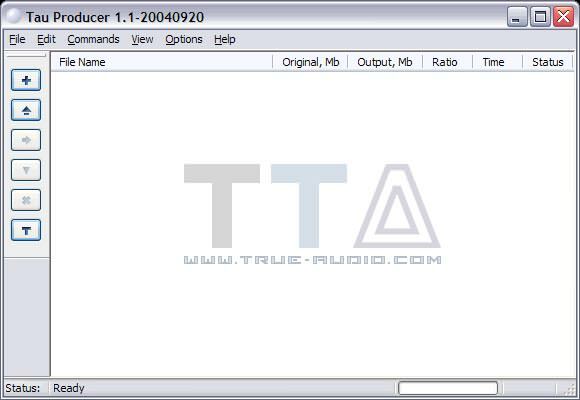 Tau Producer is the Windows GUI (graphical user interface) for the Free Lossless True Audio codec (TTA), which performs lossless compression on multichannel 8, 16 and 24-bit data of WAV audio files. The term "lossless" refers to the fact that such compression results in literally no data or quality loss; when decompressed, the audio file data are bit-identical to those of their originals. The TTA codec allows for the storage of up to 20 audio CDs worth of music on a single DVD-R, retaining the original CD quality audio, plus detailed information in the popular ID3 tag format. If you need more information please contact the developers of TAU producer (Aleksander Djuric), or check out their product website.